Through January 7 – Holiday Ice in Carolina Wren Park in downtown Anderson. There is nothing like ice skating outdoors to get you into the holiday spirit so come out and enjoy the fun! For more information call (864) 231-2601 or visit http://downtownandersonsc.com/holidayice/. Through January 14 – Skating on the Square on Morgan Square in Spartanburg. Nothing feels like Christmas quite like putting on ice skates and gliding across the ice! For more information call (864) 596-2000 or visit http://www.cityofspartanburg.org/skating-on-the-square. Through January 31 – Ice on Main on Main Street in downtown Greenville. This open-air skating rink will help you get into the spirit of Christmas while having fun with the family! For more information call (864) 232-2273 or visit http://www.iceonmain.com/. January 5 – NXT Live at the Spartanburg Memorial Auditorium in Spartanburg. For all you wrestling fans, come out and see NXT Champion Andrade “Cien” Almas with Zelina Vega, NXT Women’s Champion Ember Moon, and many more some come out for what is guaranteed to be an exciting show! For more information call (864) 582-8107 or visit http://www.crowdpleaser.com/calendar/209/NXT+LIVE. January 5 – Nashville Songwriters Benefit for Make a Wish Featuring Jim Lauderdale at the Greenwood Community Theatre in Greenwood. The soulful music of this tremendous artist will provide you with an evening filled with great music and help raise money for an outstanding cause. For more information call (864) 388-7800 or visit http://www.emeraldtriangle.us/Home/Components/Calendar/Event/4075/314?curm=1&cury=2018. January 5 – 7 – Clemson Kennel Club AKC Dog Show at the T. Ed Garrison Arena in Pendleton. If you’ve never seen an agility dog show, you should definitely come see this show, or if you have an AKC registered dog, enter your dog, or just come out and see some amazing dogs doing what they love to do . . . perform! For more information call (864) 933-3253 or visit https://calendar.clemson.edu/event/akc_dog_show_8617?utm_campaign=widget&utm_medium=widget&utm_source=Clemson+University#.Wja4uN-nGyI. January 5 – 7 – South Carolina RV and Camping Show at the TD Convention Center in Greenville. If you enjoy camping, you won’t want to miss this opportunity to visit with a variety of vendors with camping gear and those selling RV, even having the chance to tour a few RVs on site. For more information call (864) 233-2562 or visit http://tdconventioncenter.com/events/sc-rv-and-camping-show-greenville/2018/01/05/. January 9 – February 27 – “Balloonacy” at the South Carolina Children’s Theatre in Greenville. This is a charming story of an old lady who is alone on her birthday and the unexpected friend that comes into her life at just the right moment. For more information call (864) 235-2885 or visit https://scchildrenstheatre.org/shop/balloonacy-wee-play-theatre/. January 10 – 12 – “Guess How Much I Love You” & “I Love My Little Storybook” at the Gunter Theatre in Greenville. This fun event for kids Pre-K to 2nd grade will present a visual adaptation of the book by award winning author Sam McBratney and illustrator, Anita Jeram, as well as the story of a bunny who finds a wonderful and exciting story in the book he is reading. For more information call (864) 467-3000 or visit https://www.peacecenter.org/events/detail/guess-how-much-i-love-you. January 11 – Master Class with Tara Erraught at the Gunter Theatre in Greenville. Open to select ticket holders, if you are a musician or ensemble of musicians interested in working with this amazing artist, you’ll want to contact the Center! For more information send an email to education@peacecenter.org or visit https://www.peacecenter.org/events/detail/master-class-with-tara-erraught. January 12 – “Tara Erraught: In Recital” at the Gunter Theatre in Greenville. This Irish-born mezzo-soprano has an incredible voice as you will discover in her role as Hansel in this opera, Hansel und Gretel. For more information call (864) 467-3000 or visit https://www.peacecenter.org/events/detail/tara-erraught. January 12 – Chautauqua History Alive: Martha Washington at the Spartanburg County Public Library Headquarters Library on South Church Street in Spartanburg. Learn about the women of the Revolutionary War period, their strength, their courage, what they risked, and their part in the outcome of the War through the eyes of the president’s wife as portrayed by Maggie Worsdale from the Traveling Literary Theater in Charleston. For more information call (864) 244-1499 or visit http://www.greenvillechautauqua.org/?event=martha-washington-show-spartanburg&event_date=2018-01-12. January 12 – 14 – International Auto Show at the TD Convention Center in Greenville. For all of the car enthusiasts out there, this is the show for you, and if you purchase your tickets on line or at the box office, you’ll get a free year’s subscription to Motor Trend magazine. For more information call (864) 233-2562 or visit http://tdconventioncenter.com/events/south-carolina-international-auto-show/2018/01/12/. 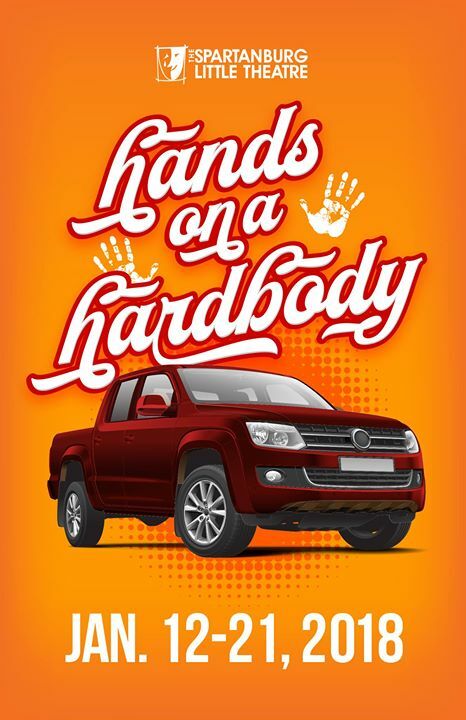 January 12 – 21 – “Hands on a Hard Body” at the Chapman Cultural Center in Spartanburg. This hilarious musical presented by the Spartanburg Little Theatre is about 10 Texans down on their luck and looking for hope all have a chance to win a brand new Nissan truck, but the trick is they have to keep one hand on the truck for 4 full days and nights, so come out and enjoy a fun and entertaining show for the entire family! For more information call (864) 542-2787 or visit https://www.chapmanculturalcenter.org/pages/calendar/detail/event/c1/e1793/&DateOfEvent=01/12/2018. January 13 – Michael Hair Memorial Roping at the T. Ed Garrison Livestock Arena in Pendleton. If you enjoy roping events, come out and see this team roping competition. For more information call (864) 710-3207 or visit https://calendar.clemson.edu/event/michael_hare_memorial_roping_2241?utm_campaign=widget&utm_medium=widget&utm_source=Clemson+University. January 13 – Wedding Festival at the Spartanburg Memorial Auditorium in Spartanburg. Your event is getting closer and your still looking for that last piece to make the event complete, this just might be the place to find what you need! For more information call (864) 582-8107 or visit http://www.crowdpleaser.com/calendar/88/Wedding+Festival. January 13 – “The Harlem Globetrotters” at the Bon Secours Wellness Arena in Greenville. This is a show you can see over and over and still be mesmerized by their talent and overjoyed by their ability to create a show filled with humor and fun. For more information call (864) 241-3800 or visit http://www.bonsecoursarena.com/events/detail/harlem-globetrotters-2018. January 13 – 14 – “Searching for Sugar Man” at the Gunter Theatre in Greenville. This 2012 Oscar Award winning documentary film about two producers who discovered a man by the name of Rodriguez who reminded them of Bob Dylan but whose recording of Cold Fact failed but how several years after his subsequent death, it was revived in South Africa. For more information call (864) 467-3000 or visit https://www.peacecenter.org/events/detail/searching-for-sugar-man. January 13 – 14 – “Window Horses” at the Gunter Theatre in Greenville. This production written and directed by the award winning filmmaker Ann Marie Fleming, is the tale of a 20 year old poet who lives with overprotective Chinese grandparents who is invited to a poetry festival and learns about her Iranian father she assumed had abandoned her, teaching the audience about building bridges of cultures and generations, about love, and finding ones voice through poetry. For more information call (864) 467-3000 or visit https://www.peacecenter.org/events/detail/window-horses. January 16 – Chautauqua History Talk: George Washington at the Hughes Library in Greenville. Come engage in a conversation led by Dr. A.V. Huff, a distinguished author and former Professor of History Emeritus at Furman University, about this amazing man, his accomplishments during and following the War. For more information call (864) 244-1499 or visit http://www.greenvillechautauqua.org/?event=talk-george-washington&event_date=2018-01-16. January 16 – 18 – “Mike Wiley’s Tired Souls: King and the Montgomery County Bus Boycott” at the Gunter Theatre. Tired Souls opens the public’s eyes to those individuals who were instrumental in “lighting a fire under the Civil Rights Movement” prior to the bus boycott of 1955. For more information call (864) 467-3000 or visit https://www.peacecenter.org/events/detail/tired-souls. January 18 – “Kristin Lee, violin” at the Brooks Center for Performing Arts in Clemson. Here is a chance to see this tremendously talented artist at this free live concert. For more information call (864) 656-7787 or visit http://www.clemson.edu/centers-institutes/brooks/events/event.html?eventid=960090. January 18 – “Miranda Lambert” at the Bon Secours Wellness Arena in Greenville. This multi-award winning country singer and songwriter will entertain you with her beautiful voice and give you a concert you won’t soon forget. For more information call (864) 241-3800 or visit http://www.bonsecoursarena.com/events/detail/miranda-lambert. January 18 – Master Class with Dameron, McManus, & Madden at the Ramsaur Studio in Greenville. Teens who are part of the Peace Voices workshop series will be able to learn more about the poetic process with the help of these visiting poets, with the general public welcome to observe. For more information call (864) 467-3000 or visit https://www.peacecenter.org/events/detail/peace-voices-master-class-1. January 18 – Poetic Conversation – Palmetto Poets: Speaking of the South at the Huguenot Loft in Greenville. This trio of professional poets from different walks of life each have something different to say about the South. For more information call (864) 467-3000 or visit https://www.peacecenter.org/events/detail/palmetto-poets-speaking-of-the-south. January 18 – February 10 – “Rockin’ the Keys” at the Center Stage Theatre in Greenville. This is Center Stage’s annual rock show featuring songs from some of the great piano artists such as Billy Joel and Stevie Wonder, with local cast members and a live rock band so come out for a great night of fun! For more information call (864) 233-6733 or visit https://centrestage.org/rockin-the-keys/. January 19 – “Patrick Davis & His Midnight Choir” at the Gunter Theatre in Greenville. This South Carolina native singer and songwriter is back with this 11 piece band to provide you with an amazing evening of music! For more information call (864) 467-3000 or visit https://www.peacecenter.org/events/detail/patrick-davis-his-midnight-choir. January 19 – 20 – “Abracadabra” at the Abbeville Opera House in Abbeville. This production will provide you with a “stage full of wonders and a performance beyond belief for the entire family!” For more information call (864) 366-2157 or visit http://www.theabbevilleoperahouse.com/Show/Details/46. January 19 – 20 – Southeast Champion Bull Riding at the T. Ed Garrison Livestock Arena in Pendleton. See the best bull riders in the southeast compete for the regional title of best bull rider! For more information call (864) 377-1479 or visit https://calendar.clemson.edu/event/se_championship_bull_riding_7134?utm_campaign=widget&utm_medium=widget&utm_source=Clemson+University#.WkbWDt-nGyI. January 19 – 21 – Remodeling Expo at the TD Convention Center in Greenville. For those of you looking to do some renovations or remodeling, here is a one stop shop of specialists to help you with your home improvement projects. For more information call (864) 233-2562 or visit http://www.homeshowcenter.com/overview/greenville. January 20 – Master Class with New York Polyphony at the Gunter Theatre in Greenville. Select musicians and ensembles who are ticket holders could have the chance to work with these amazing artists on select pieces. For more information send an email to education@peacecenter.org, call (864) 467-3000 or visit https://www.peacecenter.org/events/detail/master-class-with-new-york-polyphony. January 20 – “New York Polyphony” at the Gunter Theatre in Greenville. This vocal chamber ensemble will absolutely blow you away with their beautiful Gregorian chants and their original compositions. For more information call (864) 467-3000 or visit https://www.peacecenter.org/events/detail/new-york-polyphony. January 20 – The Greenville News Run Downtown 5K at the Greenville News on East Broad Street in Greenville. For those of you who love the cold weather, come on out for a fun morning run and/or walk with strollers being allowed, but not pets. For more information send an email to escurry@greenvillenews.com or visit http://rundowntown5k.com/. January 20 – Winter Bluegrass Jubilee at Pickens High School in Pickens. At this event you’ll enjoy a day of music, workshops, jam sessions, arts and crafts, and good food so come out and enjoy the fun! For more information call (864) 918-5277 or visit http://www.winterbluegrassjubilee.com/. January 22 – “GOBSMACKED” at the Peace Center Concert Hall in Greenville. This energy filled production is full of fun and inspiration and is not a show to be missed by adults and kids alike! For more information call (864) 467-3000 or visit https://www.peacecenter.org/events/detail/gobsmacked. January 23 – “Shen Yun” at the Spartanburg Memorial Auditorium in Spartanburg. This show will captivate you with the beauty of music and dance combined with amazing talent, and 5,000 years of history! For more information call (864) 582-8107 or visit http://www.crowdpleaser.com/calendar/203/Shen+Yun+Performing+Arts. January 23 – February 7 – “Fringe Series: The Christians” at the Center Stage Theatre in Greenville. The Pastor has decided he doesn’t believe in Hell and plans to preach a sermon of his beliefs expecting the congregation to be accepting. For more information call (864) 233-6733 or visit https://centrestage.org/fringe-series-christians/. Through January 6 – Guided Trail Ride at the Anne Close Greenway in Fort Mill. Individuals 9 years old and up can enjoy some time “in the saddle” with all experience levels welcome, so end your year with a fun horseback ride! For more information call (803) 547-4575 or visit https://www.ascgreenway.org/events/detail/guided-trail-ride-from-horse-barn-179. Through January 15 – Founders Holiday Ice Rink across from Fountain Park on Saluda Street in Rock Hill. Here is a chance to get into the holiday spirit and have fun with the entire family in Old Town and don’t miss opening day when there will also be Food Truck vendors on hand. For more information visit https://www.onlyinoldtown.com/icerink. January 5 – An Evening with Southern Songwriters at the Sage Valley Hunt Club in Graniteville. This fundraiser for the Mead Hall Episcopal School will include three singer/songwriters who either wrote for or played with the Zac Brown Band, with attendees being provided a tasty barbecue dinner, a drink ticket, a silent auction, cash bar, and a gift shop with event merchandise. For more information call (803) 293-7846 or visit https://www.visitaikensc.com/calendar/event/evening_with_southern_songwriters/. January 5 – “Chatham County Line” at the Newberry Opera House in Newberry. Here is a chance to enjoy some see good bluegrass music with one of the best bands around. For more information call (803) 276-6264 or visit http://www.newberryoperahouse.com/shows-and-events.html?show_name=chatham-county-line. January 6 – Paint Your Own Pet at the Art Nook in Aiken. This workshop for teens 11 years old and up will give them a chance to paint their pet with the help of the Nook who will have a previously submitted photo magically placed on the canvas. For more information call (803) 760-7710 or visit https://www.artnookaiken.com/events/paintyourpetteens/. January 6 – Brews and Brushes at the Art Nook in Aiken. For all of the Clemson fans out there, here is a chance to paint a Clemson Tiger while enjoying your favorite beverage. For more information call (803) 760-7710 or visit https://www.artnookaiken.com/events/clemson/. January 6 – “Three on a String” at the Newberry Opera House in Newberry. Here is yet another chance to enjoy some tremendous bluegrass/folk music with this band that has been around for 40 years and they will not disappoint you! For more information call (803) 276-6264 or visit http://www.newberryoperahouse.com/shows-and-events.html?show_name=three-on-a-string. January 6 – Joe Davis Memorial Resolution Run at Walter Elisha Park in Fort Mill. In memory of a young man who died too soon due to a drug overdose, come run a 10K, a 5K, or have the kids to a fun run with all proceeds to benefit Keystone Substance Abuse Services. For more information visit https://joedavisrun.racesonline.com/home. January 6 – February 24 – “Not Just Another Love Story” at the NarroWay Theatre in Fort Mill. This dinner show will take you back the joys and sorrows of WWII with classic 40’s songs, a great meal, and loads of nostalgia and inspiration! For more information call (803) 802-2300 or visit https://narroway.net/dinner-shows/love-story. January 7 – Greenway Bridal Showcase at the Anne Close Greenway Dairy Barn in Fort Mill. That special day will be here before you know it, so visit with a variety of local professionals and be sure to bring your fellow, as there will be fun and brews for him too with prizes, giveaway, and even games for the both of you! For more information call (803) 547-4595 or visit https://www.ascgreenway.org/events/detail/greenway-bridal-showcase. January 7 – “Balsam Range” at the Newberry Opera House in Newberry. Round out your weekend with yet another tremendous bluegrass band from the mountains of North Carolina whose musical talent will amaze you. For more information call (803) 276-6264 or visit http://www.newberryoperahouse.com/shows-and-events.html?show_name=balsam-range. January 8 & 22 – Preschool Fitness Hike at the Dairy Barn of the Anne Springs Close Greenway in Fort Mill. Bring your preschooler (ages 3 to 5) out for a hike with other parents and kids with the pace being set by the children, but bear in mind this is a woodland trail so there will be rocks and stumps to maneuver over and/or around. For more information call (803) 547-4575 or visit https://www.ascgreenway.org/events/detail/preschool-fitness-hike-7. January 9 – “The Little Red Hen” at the NarroWay Theater in Fort Mill. This interactive fun show just for the kids will be educational while being entertaining! For more information call (803) 802-2300 or visit https://narroway.net/childrens-shows/red-hen. January 11 – “Decoda with Claire Bryant” at the Wood Auditorium in Camden. This Affiliate Ensemble of Carnegie Hall is back for the 10th year with this Camden native and cellist among the featuring musicians. For more information call (803) 425-7676 or visit http://www.fineartscenter.org/events/2018/01/11/claire2018/. January 11 – “Kingdom Heirs” at the Newberry Opera House in Newberry. If you enjoy gospel, you won’t want to miss one of the South’s most amazing male quartets and the resident gospel group of Dollywood. For more information call (803) 276-6264 or visit http://www.newberryoperahouse.com/shows-and-events.html?show_name=kingdom-heirs. January 11 – “Expressions of Portraiture” Public Reception at the Center for the Arts in Rock Hill. See the work of eight artists and their connection to one of art’s oldest genres. For more information call (803) 328-2787 or visit https://tockify.com/yorkcountyarts/detail/181/1515709800000. January 12 – Adventure Seekers Kids Night Out at the Adventure Center of the Anne Springs Close Greenway in Fort Mill. Here is a chance for you to get the night off by dropping the kids off for a night of fun, starting with a pizza dinner, followed by a variety of games and activities inside and outside, and weather permitting, a fire will be built so the kids can make s’mores and/or enjoy a night hike. For more information call (803) 547-4575 or visit https://www.ascgreenway.org/events/detail/adventure-seekers-kids-night-out-49. January 12 – “Dwayne Robinson & Soulfood Jazz Band” at the Sumter Opera House in Sumter. This tremendous artist has created his own sound that will be a refreshing break from what you are used to hearing. For more information call (803) 436-2500 or visit http://sumtersc.gov/SoulfoodJazz. January 12 – 21 – “The Rainmaker” at the Aiken Community Playhouse in Aiken. A terrible drought has fallen on the west but the family is more concerned about their daughter and sister becoming an old maid, when a self-proclaimed rainmaker comes to town. For more information call (803) 648-1438 or visit http://aikencommunityplayhouse.com/shows/. January 13 & 17 – Get to Know the Greenway Guided Tour at the Anne Springs Close Greenway in Fort Mill. If you want to learn more about the Greenway, this event will tell you all about the history and provide you a van ride to take you on a tour of the facility while explaining what all is offered. For more information call (803) 547-4575 or visit https://www.ascgreenway.org/events/detail/get-to-know-the-greenway-guided-tour-94. January 13 & 20 – Explore the Greenway Guided Hike starting at the Complex of the Anne Springs Close Greenway in Fort Mill. This gentle hike is led by a Master Naturalist and will give you the chance to just enjoy a led hike and explore the trail. For more information call (803) 547-4575 or visit https://www.ascgreenway.org/events/detail/exploring-the-greenway-guided-hike-from-the-adventure-center-61. 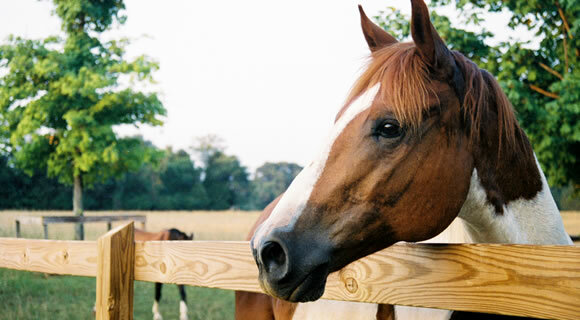 January 13, 20, & 27 – Guided Trail Ride starting at the Horse Barn of the Anne Springs Close Greenway in Fort Mill. Enjoy an hour and a half long trail ride led by the equestrian staff along the trails of the Greenway. For more information call (803) 547-4575 or visit https://www.ascgreenway.org/events/detail/guided-trail-ride-from-horse-barn-183. January 13 – Hog Butchering at Historic Brattonsville in McConnells. Learn the age old art of butchering and preserving pork for survival using 19th century techniques, with other costumed interpreters displaying other arts, such as soap making and sausage making. For more information call (803) 684-2327 or visit http://chmuseums.org/event/2322/. January 13 – “The Letterman” at the Newberry Opera House in Newberry. Back again to play all your favorite songs, you won’t want to miss seeing this tremendous group! For more information call (803) 276-6264 or visit http://www.newberryoperahouse.com/shows-and-events.html?show_name=the-lettermen. January 13 – Watercolor on Canvas with Marcia Kort Buike at the Center for the Arts in Rock Hill. In this class you’ll learn that you don’t need just watercolor paper to paint watercolor. For more information call (803) 328-2787 or visit http://www.yorkcountyarts.org/art-classes. January 14 – Historic Cabin Experience meeting at the Dairy Barn of the Anne Springs Close Greenway in Fort Mill. There are two 1800’s log cabins on site, so take a tour and learn from the Cabin Docent about their history. For more information call (803) 547-4575 or visit https://www.ascgreenway.org/events/detail/historic-cabin-experience-17. January 14 – “The Letterman” at the Sumter Opera House in Sumter. Take yourself on a historic journey with these fellows who have had over 10,000 sold out shows and will certainly give you an evening to remember. For more information call (803) 436-2500 or visit http://sumtersc.gov/TheLettermen. January 14 – “An Evening with Travis Tritt, Acoustic” at the Newberry Opera House in Newberry. Here is a chance to enjoy Travis Tritt as he sings and tells stories providing you with an intimate evening with this great Grammy Award winning country musician. For more information call (803) 276-6264 or visit http://www.newberryoperahouse.com/shows-and-events.html?show_name=an-evening-w-travis-tritt-acoustic. January 20 – Metal Sculpture Workshop at Bob Doster’s Backstreet Studio in Lancaster. Here is a chance to create your own metal sculpture or bottle tree at this fun workshop! For more information call (803) 285-9190 or visit https://www.lancastercitysc.com/events/bob-dosters-metal-art-classes-4/. January 20 – Dog Park Open House at the Anne Springs Close Greenway in Fort Mill. If you are looking for a new adventurous place for your dog to play, this might be the venue for you to scope out, but know that a membership will be required with all dog veterinary records required. For more information call (803) 547-4575 or visit https://www.ascgreenway.org/events/detail/dog-park-open-house-3. January 20 – FAC Annual Gala and Auction at the Springdale Hall Club in Camden. This event to benefit the Fine Arts Center will include cocktails, a lovely seated dinner, and wonderful silent and live auction items available with professional auctioneer, Chris Pracht, directing. For more information call (803) 425-7676 or visit http://www.fineartscenter.org/events/2018/01/20/auction2018/. January 20 – Camellia Society Show at the First Presbyterian Church in Aiken. If you think you have the most beautiful Camellia blossoms, bring it in and see if you have a winner or just come and see the beautiful flowers! For more information call (803) 279-9451 or visit https://camellia5.azureedge.net/assets/Aiken%20Camellia_%20Society%20show_schedule_for%20Augusta_JANUARY%2020%202018.pdf. January 20 – “NikKi Lane” at the McCelvey Center in York. This upstate native and “First Lady of Outlaw Country” is guaranteed to captivate you with her lyrics, flair, and “unbridled nature” so be sure to catch this show! For more information call (803) 648-3948 or visit http://chmuseums.org/event/2315/. January 20 – Come Draw With Me at the Museum of York County in Rock Hill. Presented by Piedmont regional artists, you’ll have the chance to look over their shoulders, have the chance to sketch works of art in the museum, learn tips from art students attending Winthrop University, and see a special guest from the Carolina Raptor Center, Diaval the Raven, as she demonstrates her use of a paintbrush as a tool. For more information call (803) 329-2121 or visit http://chmuseums.org/event/2323/. January 20 – Annual Fundraising Gala at the Center for the Arts in Rock Hill. The Gala will take you back to 1970’s with funky music by Chunky Daddy, retro hors d’oeuvres, a wine pull, signature cocktails, and a silent auction, so dress in your favorite 70’s attire and prepare for an evening that will be “DY-NO-MITE!” For more information call (803) 328-2787 or visit http://www.yorkcountyarts.org/that70sgala. January 21 – Classic Albums Live: Fleetwood Mac at the Newberry Opera House in Newberry. Classic Albums Live will recreate the Grammy Award winning album, Rumors, live and on stage for you just as it was created for the album. For more information call (803) 276-6264 or visit http://www.newberryoperahouse.com/shows-and-events.html?show_name=classic-albums-fleetwood-mac. January 22 – “Irving Berlins I Love a Piano” at the Newberry Opera House in Newberry. This musical revue will span seven decades of music, with 60 of his most “enduring and popular favorites” such as Puttin on the Ritz, and There’s No Business Like Show Business, so plan to take yourself on a historical journey down memory lane at this unforgettable show! For more information call (803) 276-6264 or visit http://www.newberryoperahouse.com/shows-and-events.html?show_name=irving-berlin-s-i-love-a-piano. Through January 13, 2018 – “The First South Carolinians” at the Morris Center for Lowcountry Heritage in Ridgeland. Take a look at the first individuals to come to South Carolina. For more information call (843) 284-9927 or visit http://www.morrisheritagecenter.org/events/. Through January 20, 2018 – Homegrown Heroes: The Lowcountry in World War II” at the Morris Center for Lowcountry Heritage in Ridgeland. Learn how this war impacted the lowcountry of South Carolina. For more information call (843) 284-9927 or visit http://www.morrisheritagecenter.org/exhibits/. Through February 19 – Fairy Houses & Gnome Homes at the Caw Caw Interpretive Center County Park in Ravenel. The fairies and gnomes are short on housing so stop by the Park office to find out where to go and create a home using your imagination and all natural materials. For more information call (843) 795-4386 or visit https://www.facebook.com/events/141652639942900/. January 4 – “Travis Tritt” at the Charleston Music Hall in Charleston. This will be an evening with some awesome country music by this amazing artists who has been around now for 27 years! For more information call (843) 853-2252 or visit https://www.charlestonmusichall.com/event/1592306-travis-tritt-charleston/. January 5 – “Henry Rollins – Travel Slideshow” at the Charleston Music Hall in Charleston. At this show attendees will be shown slides from Rollins travels mixed with commentary about the current state of politics, anecdotes of his recent L.A. experience to provide you with a high energy show filled with everything from anger to humor! For more information call (843) 853-2252 or visit https://www.charlestonmusichall.com/event/1574311-henry-rollins-travel-charleston/. January 5 – 6 – “Brahms” at the Gaillard Center in Charleston. This event rescheduled from September will be presented by the Charleston Symphony Orchestra and is sure to be a fantastic show! For more information call (843) 724-5212 or visit https://gaillardcenter.org/event/brahms/. January 6 – “Long Bay Symphony Woodwind Quintet” at the Winyah Auditorium in Georgetown. This will be an evening filled with chamber music to tantalize your auditory sense! For more information call (843) 461-1342 or visit http://www.winyahauditorium.com/events.html. January 7 – Chamber Music at the Dock Street Theatre in Charleston. Part of the Ovation Concert Series, you’ll enjoy world class performers and classical music masterworks in Charleston’s most historic theatre. For more information call (843) 763-4941 or visit http://chambermusiccharleston.com/th_event/ovation-concert-series-vienna/. January 8 – “Ziggy Stardust and the Spiders from Mars” Film Screening to Celebrate David Bowie’s 71st Birthday at the Charleston Music Hall in Charleston. In honor of this amazing artist’s memory you’ll enjoy this 1973 documentary and concert that was performed in London. For more information call (843) 853-2252 or visit https://www.charlestonmusichall.com/event/1598009-ziggy-stardust-spiders-from-charleston/. January 8 – March 2 – Silent Cities – Cemetery Tours at Brookgreen Gardens in Murrells Inlet. This two-hour excursion will take you on the back roads of Brookgreen to explore some of the cemeteries and learn about the burial customs of European and African origin. For more information call (843) 235-6000 or visit http://www.brookgreen.org/events/silent-cities-cemetery-tours. January 9 – “PechaKucha 28” at the Charleston Music Hall in Charleston. This show in collaboration with the Charleston Arts Festival will include a number of talented artists in this presentation style show which will be fast paced and powerful so be sure to check it out! For more information call (843) 853-2252 or visit https://www.charlestonmusichall.com/event/1604883-pechakucha-28-charleston/. 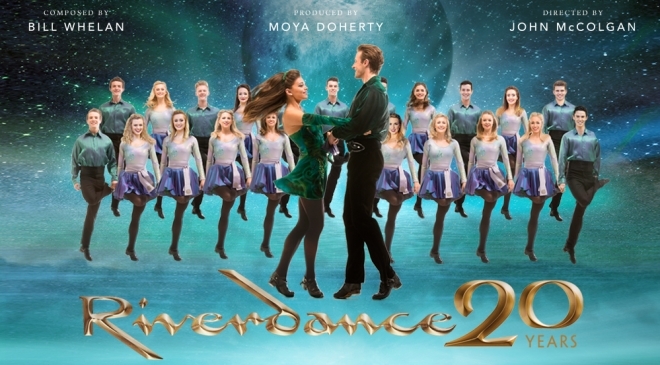 January 9 – 10 – “Riverdance” at the Gaillard Center in Charleston. These tremendously talented dancers never put on a bad show, so you won’t want to miss the chance to see them live and in person! For more information call (843) 724-5212 or visit https://gaillardcenter.org/event/riverdance/?instance_id=659. January 11 – “Julie & Julia”: Dinner & Film with 39 Rue De Jean at the Charleston Music Hall in Charleston. At this event you’ll enjoy a French dinner inspired by Julia Child at 39 Rue de Jean followed by a screening of Julie & Julia. For more information call (843) 853-2252 or visit https://www.charlestonmusichall.com/event/1606697-julie-julia-dinner-film-charleston/. January 12 – “Women and the Dead: A Tribute to the Grateful Dead” at the Charleston Music Hall in Charleston. Hear the songs of the Grateful Dead from the perspective of seven amazingly talented women musicians! For more information call (843) 853-2252 or visit https://www.charlestonmusichall.com/event/1597371-women-dead-tribute-charleston/. January 12 – 13 – “Pilobolus” at the Arts Center of Coastal Carolina on Hilton Head Island. This thrilling American modern dance company will astound you with their magical movement and tremendous talent! For more information call (843) 842-2787 or visit http://www.artshhi.com/performance-shows/pilobolus-dance. January 12 – 13 – The Charleston Symphony Orchestra Concerto Evening at the Gaillard Center in Charleston. This program will include Ivan Moshchuk on the piano and Ken Lam as the conductor. For more information call (843) 724-5212 or visit https://gaillardcenter.org/event/cso-concerto-evening/?instance_id=733. January 12 – 14 – SOS Mid-Winter Break / Winter Workshop with the host hotel being the Ocean Drive Resort in North Myrtle Beach. It’s time for the shaggers to come out and enjoy a winter gathering for dancing and fun. For more information visit http://www.shagdance.com/sosmidwinter.htm. January 13 – “Departure: A Tribute to Journey” at the House of Blues in Myrtle Beach. You’ll enjoy an evening filled with all of your favorite Journey songs. For more information visit http://www.houseofblues.com/myrtlebeach/EventDetail?tmeventid=0E005364ADDD31B3&offerid=62365. January 13 – “Travis Tritt” at the Charleston Music Hall in Charleston. If you haven’t had a chance to see him yet, here’s another chance to see this extremely talented country musician. For more information call (843) 853-2252 or visit https://www.charlestonmusichall.com/event/1592306-travis-tritt-charleston/. January 13 – 14 – Beginner Beekeeping Course at the Medical University of South Carolina Gaze’s Auditorium in Charleston. Learn the basic art of beekeeping, with the course fee including membership in the Charleston and South Carolina Bee Associations, discounts on beekeeping materials/supplies, mentor assistance, and more, with a hive visit to be scheduled in the spring when the weather warms up. For more information send an email to charlestonbees@gmail.com or visit https://sites.google.com/site/charlestonareabeekeepers/home/classes. January 16 – “Mozart Requiem” at the Gaillard Center in Charleston. Hear Mozart’s dramatic masterpiece in its entirety, however, with his untimely death, it was never completed, so don’t miss out on this guaranteed amazing performance! For more information call (843) 724-5212 or visit https://gaillardcenter.org/event/mozart-requiem/. January 16 – “In This Moment” at the North Charleston Performing Arts Center in North Charleston. This rock music group focuses on “the dark side” and will certainly provide you with a concert you won’t soon forget. For more information call (843) 529-5000 or visit https://www.northcharlestoncoliseumpac.com/events/detail/in-this-moment. January 17 – “Dr. Strangelove” at the Charleston Music Hall in Charleston. Produced in 1964, this political satire black comedy film satirizes the fear of a Cold War conflict between the United States and the Soviet Union. For more information call (843) 853-2252 or visit https://www.charlestonmusichall.com/event/1609716-dr-strangelove-charleston/. January 17 – 18 – South Carolina AgriBiz and Farm Expo at the Florence Civic Center in Florence. This free event will provide you a chance to hear some outstanding speakers and participate in some educational workshops with something for every type of agricultural business so don’t miss out on this chance to enhance your knowledge base! For more information call (843) 250-7900 or visit http://scagribizexpo.com/. January 18 – “Gershwin and Berstein Take New York” and Tonight, Tonight Gala at the Gaillard Center in Charleston. Start your evening with the Charleston Symphony Orchestra’s honoring of Bernstein’s centennial followed by the College of Charleston’s piano professor’s performance of Gershwin’s “Rhapsody in Blue”, with the Annual Gala to follow the performance with a silent auction in the Grand Ballroom while mingling with the musicians and other guests. For more information call (843) 724-5212 or visit https://gaillardcenter.org/event/gershwin-bernstein-take-new-york/. January 18 – “New Standard Time: The Great American Songbook” at the Charleston Music Hall in Charleston. Nnenna Freelon and the Charleston Jazz Orchestra will provide you with one unforgettable evening of fabulous music! For more information call (843) 853-2252 or visit https://www.charlestonmusichall.com/event/1603322-new-standard-time-great-charleston/. January 18 – “Shopkins Live” at the North Charleston Performing Arts Center in North Charleston. Every little girl will absolutely love this show . . . and likely so will their mothers and other adult female relatives! For more information call (843) 529-5000 or visit https://www.northcharlestoncoliseumpac.com/events/detail/shopkins-live. January 18 – 21 – Charleston Jazz Festival at a variety of locations around Charleston. It’s that time of year again when people from all over the southeast flock to Charleston to enjoy this four day festival with some of the greatest jazz musicians performing so be sure to put this weekend on your calendar! For more information call (843) 641-0011 or visit https://charlestonjazz.com/festival/. January 19 – “The Five Browns” at the Gaillard Center in Charleston. With all five siblings being the first family to have five members accepted to Juilliard, these extremely talented musicians will blow you away! For more information call (843) 724-5212 or visit https://gaillardcenter.org/event/5-browns/. January 19 – “Eddie B. ‘Teachers Only’ Tour” at the North Charleston Performing Arts Center in North Charleston. This comedian is tapping into the minds of teachers to create a type of comedy that is taking him right to the top of the comedy charts! For more information call (843) 529-5000 or visit https://www.northcharlestoncoliseumpac.com/events/detail/eddie-b-teachers-only-tour. January 19 – February 4 – “Vanya & Sonia & Masha & Spike” at the Footlight Players Theatre in Charleston. This 2013 Tony Award Winner for Best Play will leave you filled with laughter throughout the production and beyond! For more information call (843) 722-4487 or visit http://footlightplayers.net/events/vanya-sonia-marsha-spike/. January 20 – “Johnny Lang Signs World Tour” at the House of Blues in Myrtle Beach. You’ll enjoy an evening filled with this tremendous blues artist! For more information visit http://www.houseofblues.com/myrtlebeach/EventDetail?tmeventid=0E005301DAE3B0A7&offerid=53857. January 20 – “Kenny G” at the Gaillard Center in Charleston. This astounding musician and Grammy award winner, whose career spans three decades, will fill your evening with the beautiful sounds of his saxophone! For more information call (843) 724-5212 or visit https://gaillardcenter.org/event/kenny-g/. January 20 – “PBR: Real Life Pain Relief Velocity Tour” at the North Charleston Coliseum in North Charleston. This show is filled some of the most amazing bull riders, so if you like this kind of show, you won’t want to miss it! For more information call (843) 529-5000 or visit https://www.northcharlestoncoliseumpac.com/events/detail/pbr-real-time-pain-relief-velocity-tour. January 20 – 21 – “The Giver” at the Dock Street Theatre in Charleston. Based on the award winning book for young people, tells the story of a boy who lives in a perfect world but is given the role of “Receiver of Memory” and learns what all the society had to give up to achieve the conflict free world! For more information call (843) 577-7183 or visit https://www.charlestonstage.com/shows-and-tickets/51-the-giver.html. January 23 – “They Might Be Giants” at the Charleston Music Hall in Charleston. Back on the road with a new show and an expanded line-up of musicians, some come out and enjoy the show! For more information call (843) 853-2252 or visit https://www.charlestonmusichall.com/event/1581143-they-might-be-giants-charleston/. January 23 – 24 – “Shen Yun” at the North Charleston Performing Arts Center in North Charleston. This tremendous show filled with traditional Chinese cultural performing arts is filled with color and dancing, and will absolutely mesmerize you! For more information call (843) 529-5000 or visit https://www.northcharlestoncoliseumpac.com/events/detail/shen-yun-2. January 23 – February 24 – “I Got You Babe” at the Thirty-Four West Theatre in Charleston. A small city girl finds herself working in a big city 1960’s department store in this All New “groovical” by the sellout hit “Groovy Kinda Love”. For more information call (843) 901-9343 or visit https://www.34west.org/tickets/i-got-you-babe.